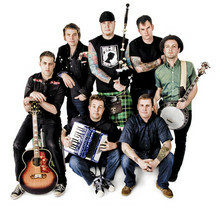 The Dropkick Murphys, the nation’s favorite Celtic-influenced punk rockers, are back on the road for their nearly annual late-fall tour. Embraced by Martin Scorsese — remember the distorted guitars and bagpipes during The Departed’s climax? — and their-native Boston sports icons alike, the Murphys return for a show at Oakland’s Fox Theater on November 6th. Lead vocalist Al Barr spoke with SF Station during a phone interview from his home in Massachusetts. SF Station (SFS): It must be kind of a bittersweet time for you this time of year with the Yankees and the Phillies in the World Series. SFS: It seems like these late-fall tours are becoming a good routine for the band — you head out for about a month, sell out some mid-sized venues and then return home. AB: December is a tough month for the bass player and myself. There is Christmas and two of Kenny’s three children and both of my children were born in December. AB: You better believe it. SFS: The band still spends a lot of time on the road for the remainder of the year. Is it hard to juggle family duties and touring? AB: It’s one of those things, where this is what we do. Especially after we put out a new record, we expect to be on the road a lot. The other side is when we are home, we are home 24/7 and we get to have all that time with our family. That is something the nine-to-fiver doesn’t get, so we feel pretty lucky with that. SFS: It has been a couple of years since the last record, can we expect to hear some new music this time around? AB: We won’t be debuting any new music, but we are working on a new record that will come out at some point during the next year. We are putting out a new live record as well. SFS: After the band’s success over the last couple of years, what do you think when you look out at the audience at your shows? AB: I think we still have a core following that has been with us since the beginning, and we are really fortunate to have that through the years. Through The Departed and other things we’ve done, we have also definitely garnered a wider audience. I think we still get a lot of people from all of the touring we have done and from word of mouth. But, that’s not to say there aren’t been people who have heard “I’m Shipping Up to Boston,” and decided to see us. There are people who stand there and wait for that song, and there are other people who have heard the song and bought the record and got into it. SFS: What are you usually doing when the audience begins the “Let’s go Murphys” chant at the start of your shows? AB: We are just going over the set list and getting ready to go on and do our best for the people who paid their hard-earned money to see us. It is by no means routine. I always get butterflies before I go on and I still get anxious, but it’s in a positive way. 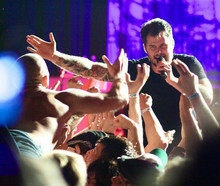 In terms of the Dropkick Murphys experience, the audience and the sing-along aspect is important for a show to be good. SFS: You have been doing this for a lot of years, and I can’t image it’s easy on the vocal chords. How is your voice holding up? AB: It’s like anything else. The vocal chords are muscles, and the more you use them the easier it is. But as I get older— thank you for pointing that out! — it becomes more challenging. You do what you gotta do. I do mundane vocal warm-ups and all kinds of different things to keep myself in fighting shape. I want to get to the ripe age of 150 in punk rock years — they are just like dog years. AB: I love SF. I’ve been coming there for a lot long. Before I started touring, my wife and I always loved San Francisco. We have a lot of good friends there and the crowds are always really good. We are in Oakland this time, which I know is not SF Proper, but I also enjoy being at the Warfield because you can walk and enjoy some of the city. Although, the block of the Warfield is a little bit sketchy. Seeing a she-male at 10 in the morning is a little alarming. It reminds me of New York City, circa 1983. SFS: It is all part of the San Francisco experience. AB: Exactly, and we embrace that — not the she-males, so much, but the experience. 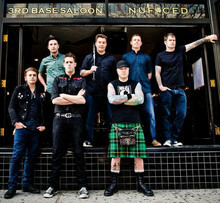 Dropkick Murphys perform at the Fox Theater on November 6th. Tickets are $29.50 and the concert starts at 7pm.